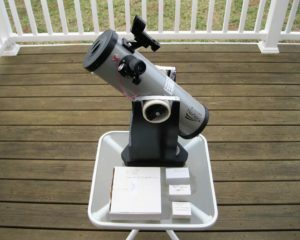 4.5″ f/3.5 Dobsonian. Easy to use beginner scope. Good for sun, moon, planets and brighter deep sky objects. Comes with solar and light pollution filters, 10mm and 25mm eyepieces. Light weight, table-top, alt-az mount. Red LED Star Pointer finder. Stored by/Loaned to: James D.